Administration, Hill, and industry sources do the math on what could be the summer’s most contentious confirmation battle. Most telling is the basic Senate math. According to two senior Senate aides—one whose boss favors Warren and the other whose boss would prefer an alternative—pretty much every Senate Democrat (and Independent) would find it agonizingly difficult to join a filibuster of Warren’s nomination, which would mean opposing an outspoken consumer advocate at a time of deep anti-Wall Street sentiment. Simply put: Hoping the president will choose another candidate—something that describes several Senate Democrats—isn’t the same as opposing his eventual nominee. The biggest possible exception to this is Nebraska Senator Ben Nelson, who hasn’t been shy about bucking Democrats on other priorities, like extending unemployment benefits. Nelson returned from the Fourth of July recess anxious about the size of the new agency’s budget and its accountability to Congress. (Though spokesman Jake Thompson says the senator’s concerns have largely been defused, and that he hasn’t taken a position on any potential nominee.) He later fretted that it could become a “rogue agency” under the wrong leadership. So suppose the entire Democratic caucus were to support Warren except Nelson and another moderate, leaving her two votes shy of the 60 she needs. There are four realistic places to find the additional votes: Republicans Scott Brown of Massachusetts, Susan Collins and Olympia Snowe of Maine, and Chuck Grassley of Iowa. The first three voted for the final version of financial reform; Grassley supported the Senate version in May. Of course, there’s always the possibility that a senator leaning 'yes' could lose his or her nerve once Warren were nominated and the lobbying began in earnest. (Recall that both Grassley and Snowe both flirted with backing health care reform before ultimately voting no.) And it’s hard to believe the swing senators won’t face pressure from the financial services industry. Warren has made her distaste for big banks clear over the years, and it’s a feeling that’s generally reciprocated. Privately, the banks worry that Warren will make certain types of consumer lending unprofitable; they warn that this will constrict the supply of credit. But, for the moment, what’s interesting is the banks’ silence. Three industry officials I spoke with took care to assure me that their organizations aren’t actively opposing Warren. One defied me to find someone in the industry who was. 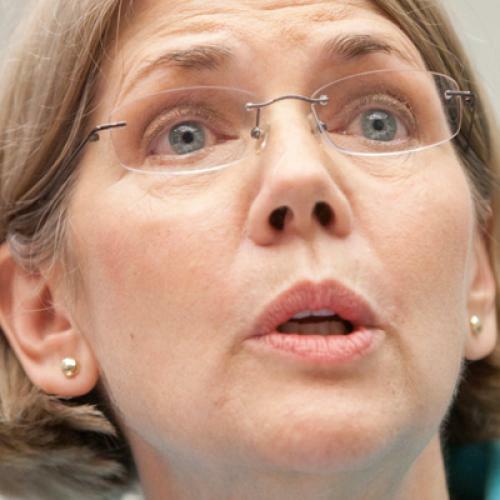 Another reflected that, from the banks’ perspective, Warren might actually be preferable to Michael Barr, an assistant Treasury secretary who is also a leading candidate for the position. This isn’t absurd: Barr, like Warren, is a former law professor known for his passion for consumer issues. He played a key role in passing the legislation that created the agency. Still, the lengths to which the industry has gone to avoid appearing to oppose Warren suggests it isn’t entirely confident it can defeat her on the Hill. After all, if the banks were to come out against Warren before the White House had settled on a nominee, the president would almost have to nominate her to demonstrate his independence. If the banks were more optimistic about their chances, they might not fear this scenario. Instead, they seem unsettled by it. In fact, it’s not clear that the banks would put up much of a fight even if Warren were nominated—at least not directly. (Working through trade groups is another story.) Bank of America and Citigroup both won badly-needed political points by supporting the consumer agency during the financial-reform fight, albeit with some important quibbles. It’s hard to believe they’d want to draw down this political capital blocking the agency’s first nominee. If nothing else, they’d stand a good chance of alienating their future regulator. Which brings us to the administration. A week and a half ago, the Huffington Post ran a piece reporting that Treasury Secretary Tim Geithner had “expressed opposition” to Warren’s nomination, attributing the claim to “a source with knowledge of Geithner's views.” Beyond the sourcing, there is reason to be skeptical of the piece. Whether or not Geithner has any reservations about Warren, he is shrewd enough to know when to hold his fire internally. And this would appear to be such an occasion. Among other things, Geithner had just expended capital lobbying the White House on behalf of his Treasury colleague Gene Sperling, whom he supported as a replacement to Peter Orszag at OMB. It’s unlikely he would have jumped into another behind-the-scenes campaign soon after. All the more so given that Warren has powerful advocates elsewhere in the administration. It was lost on no one that the White House sat Warren in the front row of the financial-reform bill signing ceremony last week, then let it be known that Warren and Obama confidant Valerie Jarrett dined together afterward. Treasury officials maintain that the secretary thinks highly of Warren, and Geithner has been effusive about her in recent days, most recently on ABC’s “This Week” on Sunday. Though no one can say for sure which way the president is leaning, there’s a powerful logic for nominating Warren: The administration spent months fighting for a tough consumer agency. It would almost certainly have died (or been gutted) if not for the president’s personal intervention. But, having won a historic substantive victory, the White House is under pressure to reap the full political benefit of the win. And it may not be able to do that without nominating Warren. But, as one veteran activist pointed out to me last week, the political logic of nominating Warren extends beyond progressives. Warren’s impatience with big banks has resonance across the political spectrum—one senator who’s been sympathetic during her congressional testimony is the arch-conservative Jim Bunning of Kentucky. The activist, who thinks highly of the president and the Democratic leadership, laments the public perception that they’re too close to Wall Street. “It’s in some respects about the most bizarre thing that could have happened to a Democratic administration,” this person says. “[Obama] has got to change that. Not so much with progressives. But with the broad mass of American people.” Elizabeth Warren, the thinking goes, may be uniquely positioned to help here. Still, one can get carried away with this logic. It’s doubtful that the average American knows who Warren is, or that they’ll be moved by the president’s choice to head the consumer agency, regardless of who it is. In fact, one could argue that the only way the decision plays in Middle America is if the GOP and Wall Street make it an issue, by digging in for a bruising fight. Which is why, in the end, it wouldn’t be surprising to see Warren nominated—and then quickly approved in an anticlimactic vote.